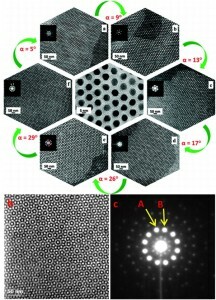 (a) Angular dark-field STEM (DF-STEM) images shows different Moiré interference patterns arising from rotational offsets between respective monolayer sheets. (b) & (c) DF-STEM image with SAED pattern shows 12-fold quasicrystalline-like Moiré pattern revealed when the misorientation angle between two CdS nanorod layers is close to 30°. Barrett, C. A., Singh, A., Murphy, J. 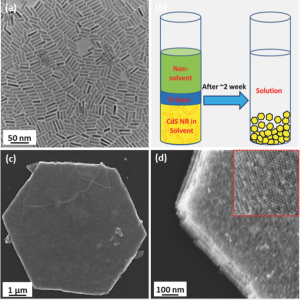 A., O’Sullivan, C., Buckley, D. N. & Ryan, K. M. Complete Synthesis of Germanium Nanocrystal Encrusted Carbon Colloids in Supercritical CO(2) and their Superhydrophobic Properties. 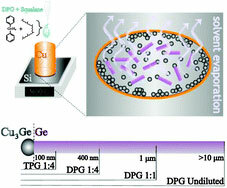 Langmuir 27, 11166-11173, doi:10.1021/la2020868 (2011). 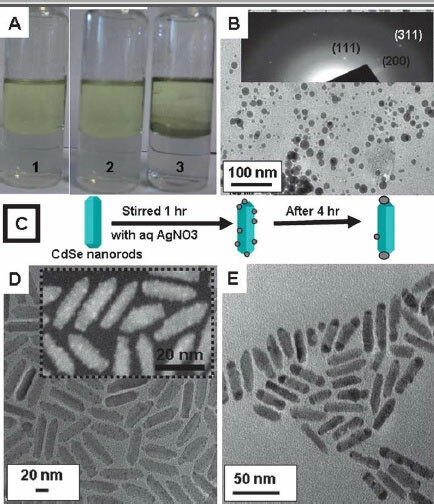 Bala, T. O’Sullivan, C. Singh, A. Ryan K. M. Silver tip formation on colloidal CdSe nanorods by a facile phase transfer protocol. 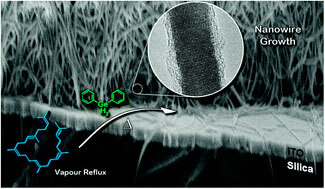 Journal of Materials Chemistry 21, 6815-6820, doi: 10.1039/C0JM04324A, (2011). 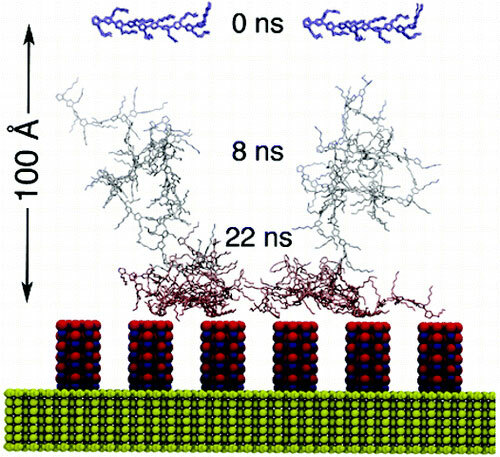 O’Sullivan, S. Crilly, S. Laffir, F. R. Singh, A. Magner, E. & Ryan, K. M. Protein immobilisation on perpendicularly aligned gold tipped nanorod assemblies, Chemical Communications, 47, 2655-2657, doi: 10.1039/c0cc05182a (2011). Singh, A., R. D. Gunning, A. Sanyal and K. M. Ryan. Directing Semiconductor Nanorod Assembly into 1D or 2D Supercrystals by Altering the Surface Charge. Chemical Communications, 46 (38), pp. 7193-7195. ISSN: 1359-7345. 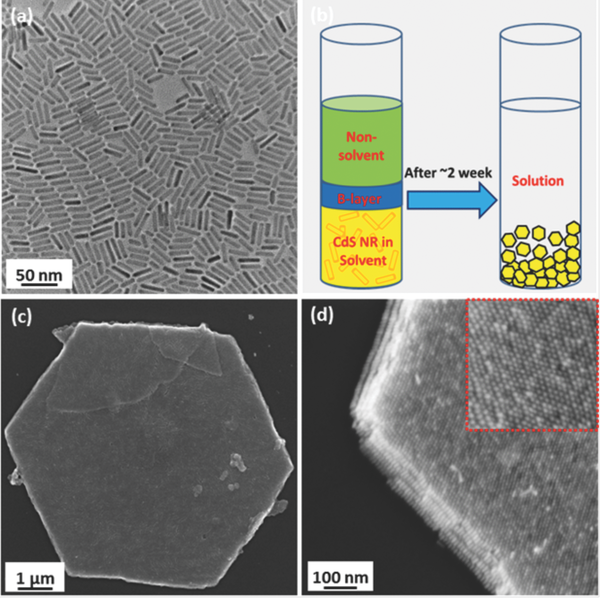 Barrett, C.A., Gunning, R.D., Hantschel, T., Arstila, K., O’ Sullivan, C., Geaney, H., Ryan, Kevin M. ‘Synthesis of Silicon and Ge-Core/SiOx-Shell Nanowires from Metal Surfaces by Supercritical Fluid-Solid-Solid Growth’ J. Mat. Chem. 2010, 20 135. Gandhi, A. A., Gunning, R. D., Ryan, K. M. & Tofail, S. A. M. The Role of Texturing and Densification on Optical Transmittance of Hydroxyapatite Ceramics. Journal of the American Ceramic Society 93, 3773-3777, doi:10.1111/j.1551-2916.2010.03925.x (2010). Gunning, R. D., O’Sullivan, C. & Ryan, K. M. A multi-rate kinetic model for spontaneous oriented attachment of CdS nanorods. Physical Chemistry Chemical Physics 12, 12430-12435, doi:10.1039/c0cp00196a (2010). Sanyal, A., Bala, T., Ahmed, S., Singh, A. Piterina, A. V., McGloughlin, T. M., Laffir, F. R. and Ryan, K. M. Water Dispersible Semiconductor Nanorod Assemblies via a Facile Phase Transfer and Their Application as Fluorescent Biomarkers J. Mater. Chem. 2009, 19, 8974. Barrett, C.A., Dickenson, C., Ahmed, S., and Ryan, Kevin M. ‘Evolution of Pseudo-Spherical Silicon Nanocrystals to Tetrahedra, Mediated by Phosphonic Acid Surfactants’ Nanotechnology., 2009, 20, 275605. O’Sullivan, C.; Gunning, R. D.; Sanyal, A.; Barrett, C. A.; Geaney, H.; Laffir, F. R.; Ahmed, S.; Ryan, K. M. ‘Spontaneous room temperature elongation of CdS and Ag2S nanorods via oriented attachment’ Journal of the American Chemical Society 2009, 131, 12250-12257. 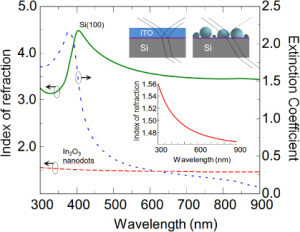 Ahmed, S. Ryan, K. M,’Centimeter scale assembly of vertically aligned and close packed semiconductor nanorods from solution’ Chemical Communications. 2009, 6421. O’Sullivan, C. Ahmed, S. Ryan, K. M. ‘Gold tip formation on perpendicularly aligned semiconductor nanorod assemblies’ J. Mat. Chem. 18, 5218, 2008. Hanrahan, J. P., Copley, M. P., Ryan, K. M., Morris, M. A. 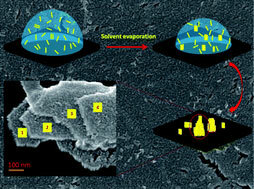 & Holmes, J. D. Pore expansion in mesoporous silicas using supercritical carbon dioxide. Chemistry of Materials. 16, 424-427 (2004). 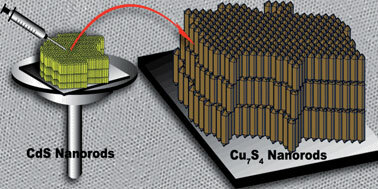 Ziegler, K. J., Polyakov, B., Kulharni, Ryan, K. M., Morris, M. A., Erts, D. & Holmes, J. D. Conductive films of ordered nanowire arrays. Journal of Materials Chemistry. 14, 585-589 (2004). Ziegler, K. J., Ryan, K. M., Rice, R., Crowley, T. A., Erts, D., Olin, H., Patterson, J., Spalding, T. R., Holmes, J. D. & Morris, M. A. The synthesis of matrices of embedded semiconducting nanowires. Journal of the Chemical Society: Faraday Discussions 125, 311-326 (2004). Ryan, K. M., Erts, D., Olin, H., Morris, M. A. 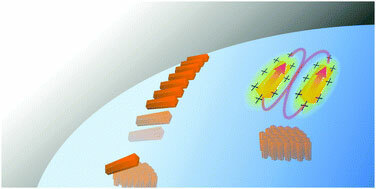 & Holmes, J. D. Three dimensional architectures of ultra-high density semiconducting nanowires deposited on chip. Journal of the American Chemical Society. 125, 6284-6288 (2003). Ziegler, K. J., Harrington, P. A., Ryan, K. M., Crowley, T. A., Holmes, J. D. & Morris, M. A. Supercritical fluid preparation of copper nanotubes and nanowires using mesoporous templates. Journal of Physics: Condensed Matter 15, 8303-8314 (2003). 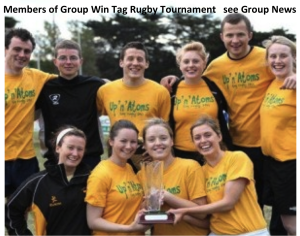 Ryan, K. M., McGrath, J. P., Farell, R. A., O’Neill, W. M., Barnes, C. J. & Morris, M. A. Measurements of the lattice constant of ceria when doped with lanthana and praseodymia—the possibility of local defect ordering and the observation of extensive phase separation. 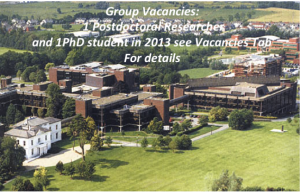 Journal of Physics: Condensed Matter 15, L49-L58 (2003). Holmes, J. D., Morris, M. A. & Ryan, K. M. Macroporous materials as templates for semiconductor nanowire assembly book chapter in Self assembly (ed. Robinson, B. H.) 175-183 (IOS Press, Amsterdam, 2003). Lyons, D. M., Morris, M. A. & Ryan, K. M. The preparation of ordered mesoporous ceria with advanced stability. Journal of Materials Chemistry. 12, 1207-1212 (2002). Lyons, D. M., Ryan, K. M., Morris, M. A. & Holmes, J. D. Tailoring the optical properties of nanowires through strain. 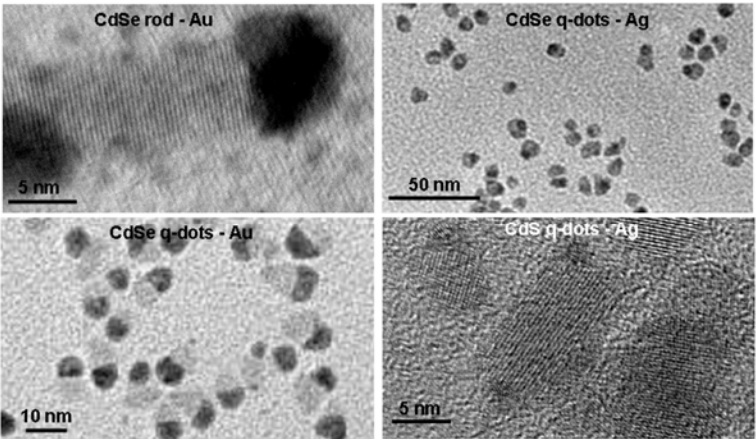 Nanoletters. 2, 811-816 (2002). Ryan, K. M., Coleman, N. R. B., Lyons, D. M., Hanrahan, J. P., Spalding, T. R., Morris, M. A., Steytler, D. C., Heenan, R. K. & Holmes, J. D. Control of pore morphology in mesoporous silicas synthesised from triblock copolymer templates. Langmuir 18, 4996-5001 (2002). Ryan, K. M., Holmes, J. D., Crowley, T. A. & Morris, M. A. 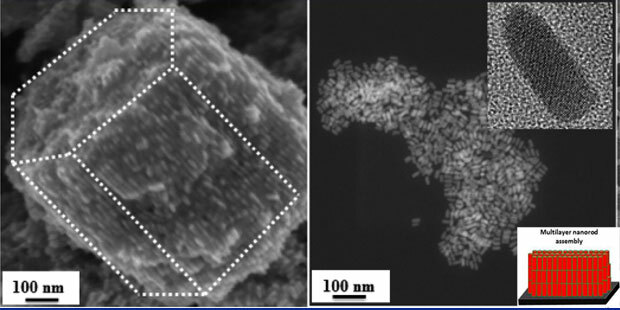 The use of templated mesoporous materials as templates for the development of ordered arrangements of nanowires and nanorods of electronically important materials Studies in Surface Science and Catalysis 141, 337-343 (2002). Coleman, N. R. B., Ryan, K. M., Spalding, T. R., Holmes, J. D. & Morris, M. A. 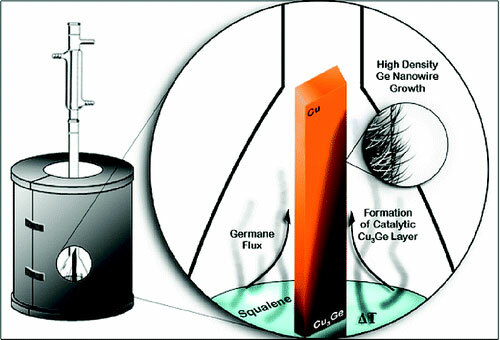 The formation of dimensionally ordered germanium nanowires within mesoporous silica. Chemistry Physics Letters. 343, 1-6 (2001). Coleman, N. R. B., O’Sullivan, N., Ryan, K. M., Crowley, T. A., Spalding, T. R., Steytler, D. C., Morris, M. A. & Holmes, J. D. Synthesis and characterization of dimensionally ordered semiconductor nanowires within mesoporous silica. Journal of the American Chemical Society 123, 7010-7016 (2001).11. Ahmed, S.; Barrett, C. A.; O’Sullivan, C.; Sanyal, A.; Geaney, H.; Singh, A.; Gunning, R. D.; Ryan, K. M. , ‘Electrphoretic Deposition of Spherical and Rod Shaped Nanocrystals’ ECS Transactions 2009, 19, 209-219. O’Sullivan, C.; Gunning, R.; Barrett, C.; Singh, A.; Geaney, H.; Sanyal, A.; Ahmed, S.; Bala, T.; Ryan, K. Facet Specific Gold Tip Growth on Semiconductor Nanorod Assemblies ECS Transactions 2009, 25, 17-29.